Former France captain Michel Platini has been elected as Uefa's new president, ahead of rival Lennart Johansson after a vote in Dusseldorf. Johansson, 77, has held the post for the last 16 years. 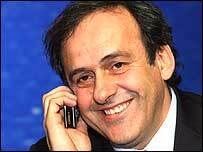 Platini wants to limit the number of Champions League places to three per country, rather than the current four. "This is just the beginning of an adventure. I'm happy to be able to represent European football. I'm very moved and very happy," Platini said. "When I was a footballer, when you won a great victory you received a cup and went on a lap of honour. "This is a great victory for me but I'm not going to do a lap of honour because now the work starts." Platini revealed he would push on with his plans to re-shape the Champions League, with his sights set on the new format starting in 2009. He said: "I talked about finding a better equilibrium for the number of clubs and that's for 2009-10. "The final decision will be by Uefa's executive committee in April so we have a few months still to see which way we will go, but I would like a better equilibrium, it is very close to my heart. "If you are just talking about one club in England, that doesn't convince me that it's not the right thing to do." BBC sports editor Mihir Bose said: "He's a populist - within minutes of his election he showed glimpses of a populism that wouldn't have disgraced Tony Blair. "It won't be easy, but he certainly has a plan. "He's already proposed that the four Champions League places currently granted to clubs from England, Italy and Spain should be cut down to three. "He's also going to push for cost control - possibly a limit on players' salaries in proportion to clubs' turnover." Platini said he was proposing salaries be no more than "something like 50-60% of turnover" but insisted what he envisaged was "not a salary cap". The election result was close - had Platini won two fewer votes he would not have achieved an absolute majority of the 50 valid votes and a second ballot would have been held. The 52 members who now comprise the European confederation, the richest and most influential in world football, decided on the outcome in a secret ballot. Platini immediately invited Johansson to become an honorary president of Uefa. The 51-year-old former France star said: "This is a great victory but I have huge admiration for Lennart and I would ask for Lennart Johansson to become an honorary president of Uefa." Johansson was given a standing ovation by the delegates at the invitation of Platini. The Swede was openly against Platini's proposed changes to the Champions League. Johansson said: "I don't want to be impolite to a colleague on the executive committee. I've already asked him why he wants to introduce changes to this success story. "The Champions League is covered by numerous television stations around the world and there are a lot of sports that are trying to copy it. "The future is his but he has to learn and gain in experience." Sports minister Richard Caborn congratulated the new president and paid tribute to his predecessor. "Uefa have now made their decision and I want to thank Lennart Johannson for leading Uefa into a constructive dialogue on the European governance of football," he said. "I congratulate Michel Platini on his election, look forward to meeting him and continuing the constructive dialogue that we started a few weeks ago."